With duct tape over his mouth, former U.S. Junior Men’s Champion Nicholas LaRoche is speaking out. LaRoche, who currently coaches at the Toyota Sports Center outside of Los Angeles, is one of the more than 8,000 people who have become the face of NOH8, a public campaign for equality. Started by photographer Adam Bouska and his partner Jeff Parshley, NOH8 is a photo project started in response to the passage of Proposition 8 in California. The proposition, passed in November 2008, added a new provision to the state constitution that says “only marriage between a man and a woman is valid or recognized in California”. Photos from the NOH8 campaign feature subjects with duct tape over their mouths, symbolizing their voices being silenced by Prop 8 and similar legislation around the world, with “NOH8” painted on one cheek in protest. 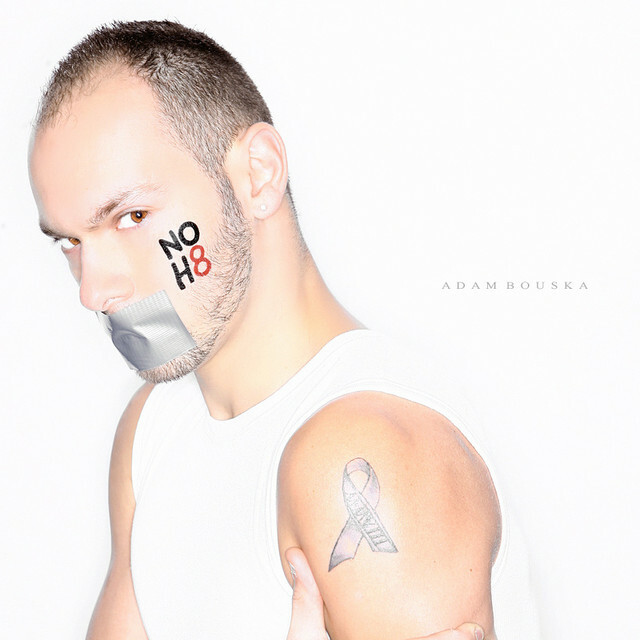 The NOH8 photo shoots began with everyday Californians but has since expanded to include celebrities and even professional figure skater turned fashion designer Michael Kuluva. LaRoche, who also oversees the US Athletic Foundation, which helps provide financial assistance to athletes including 2010 Grand Prix Final Champion Alissa Czisny, recently spoke with Figure Skaters Online about his involvement with NOH8. When did you become involved with NOH8? Backing the whole Proposition 8 issue in California has been something that I felt needed my support and attention from the moment it started in 2008. I’m not one of those people who at this point is going down that path of being married, but you know when my time comes I would like the right to spend my life with a man who truly loves me for me. There are so many situations out there were people are unhappy, whether it’s a situation where a man has a wife and children because that’s what he was forced to do, or a woman never has a significant other because she is afraid of what other friends, peers, or co workers will think of her, or a bisexual being who will go a cheat on their spouse because they can’t be open of what they truly are attracted to. In my belief I feel that all of this can only start to create a world where people can communicate as true human beings, be who they truly are, and not have to put any sort of label on who you love. Love is an amazing thing when it’s real, who would ever want to take that from someone? How did you get involved? After reading up on the NOH8 facts, I learned that in nearly two years since its inception, the NOH8 Campaign has grown to over 5,500 faces and it continues to grow at an exponential rate. The campaign began with portraits of everyday Californians from all walks of life and soon rose to include politicians, military personnel, newlyweds, law enforcement, artists, celebrities and many more. Working with children and having had my face out on the athletic circuit for some time I figured this would be a great way to keep my strong beliefs known on this matter. I feel like this is something that is getting known a lot more throughout the country and being involved in a sport that has so many gay athletes, coaches and officials I felt that this is only going to build the backings for the GLBT (gay, lesbian, bisexual, transgender) people to be themselves. How did the photo shoot come about? The photo shoots have different “call points” so that it can keep the campaign growing and making is assessable to everyone who wants to have a photo done. The one I attended was held in November 2010 at the W Hotel – Hollywood. You can check the website at www.noh8campaign.com and they offer information on where and when the next shoot will be taking place. Tell me more about your photo. I elected to do my own solo photo and then my students had asked if I was interested in doing one with them with their skates as a prop. To have some of my students want to be a part of this and strongly support this cause at such a young age I couldn’t say no to that. My whole thing with teaching isn’t always about an on ice working relationship. I tend to turn my attention to not only skating but lessons in life so that when these kids go off to college, or out into the real world, and don’t see me everyday that they have learned something so much greater then just ice skating technique. This was the perfect situation about life, support and being free. Who are the two students with you? In the photo with me is Samantha McCain, she’s the blonde, and Gina DeNatale, who is the brunette. Our photos are on the web site under photos 6501-6750. Some NOH8 photos have been used very prominently in the media. What are the plans for your photo? What they do after you get your photo is post them online under the NOH8 Campaign where you are able to see the growing support of funding and acknowledgement of the amounts of people who are pushing through for this world to be a free place. The images are currently being used on various social networking sites to spread the message of equality, predominantly Facebook and Twitter. Eventually the images are expected to be compiled for a large-scale media campaign. I can only hope that my photo will have some sort of impact or awareness to others by keeping our ‘labels” to a minimum and allowing us to walk in our shoes with no second look — well unless they think we are pretty. For more information on NOH8, visit www.noh8campaign.com. I just spoke with Scottie. Can you call me and we can discuss?